The trail is in a shape called a lollipop. You go up the stem, around the pop in either direction, and back down the stem to your start. There are five stream crossings, but all are easy. The far end is about 80 feet lower than the trailhead, but the trail is never steep. The “steepest” section is to the right at the loop junction. If you prefer to go uphill, go clockwise; if you prefer to go downhill, go counter-clockwise; if you don’t care, hike your own hike! Parking is problematic on Flagg Road, so your best option is to use Alcorn Crossing nearby. This trail, constructed in late 2014, connects two properties owned by the Conservation Commission. The town acquired the property at the trailhead in 2000, while the larger landlocked parcel was donated by George and Virginia Kloppenburg in 1998. In the 1980s and 1990s Tom Paul, who lived nearby, became very interested in some remarkable trees in that woodland. 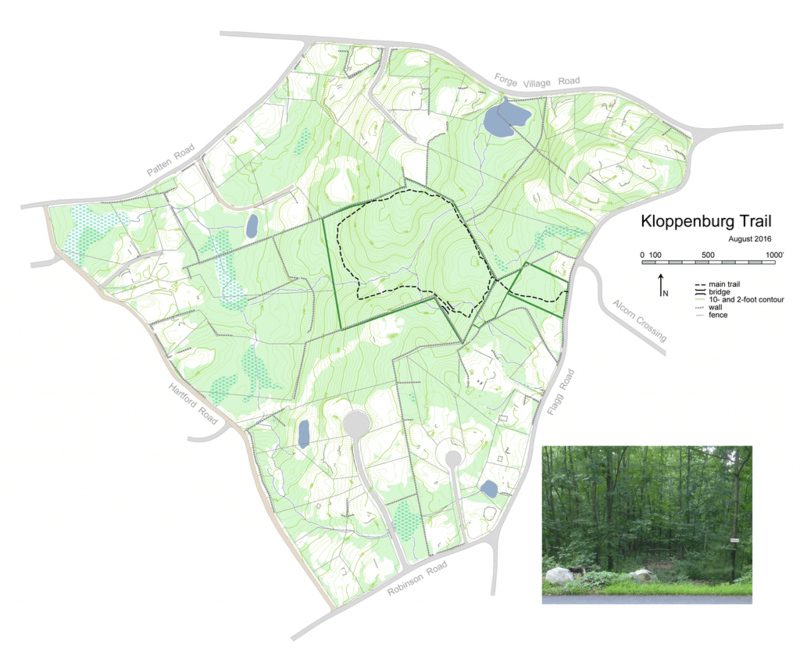 He discussed the value of those notable trees with Mr. Kloppenburg, and later Tom became very pleased when the Kloppenburgs donated that land to the Town of Westford. Even though it was land-locked at that time, Tom believed that the land was valuable as Conservation Land because of benefits to wildlife and water protection. When the land became accessible years later, it was even more valuable to the townspeople. An easement in the intervening area was granted by Brenda and Perry Gould in 2014, paving the way for an unpaved trail to this interesting area of mixed forest and streams.